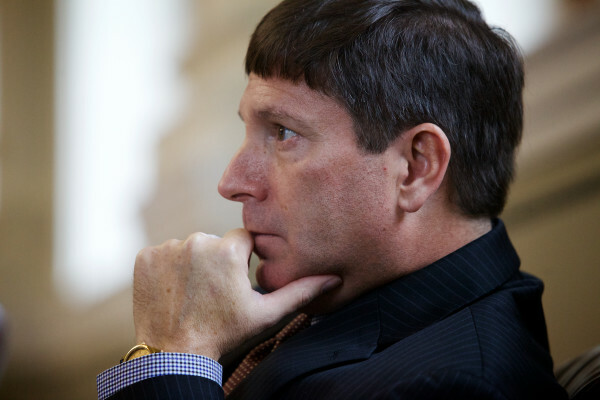 AUGUSTA, Maine — House Minority Leader Ken Fredette, R-Newport, said Wednesday morning that legislative leaders left him out of the development of their plan to combat drug addiction in Maine. Fredette said that he attended a meeting with lawmakers and law enforcement officials on Monday but at that time the details of the plan were being discussed in broad strokes. At issue is a news conference scheduled for Wednesday afternoon at the State House, at which a plan will be unveiled to provide funding for at least 10 new Maine Drug Enforcement Agency investigators as well as expanded drug addiction and treatment recovery services. Lawmakers are reacting to an ultimatum by Gov. Paul LePage that they commit to funding 10 new agents by Dec. 10 or he will call on the Maine National Guard to become more involved on the law enforcement side of the drug fight. A news release from House Speaker Mark Eves’ office announcing Wednesday’s press conference did not mention Fredette. “The plan is the result of collaboration by Speaker of the House Mark Eves, Senate President Mike Thibodeau and Senate Democratic Leader Justin Alfond of Portland and other lawmakers, law enforcement officials and public health advocates,” reads the release. Lindsay Crete, a spokeswoman for Eves, a Democrat from North Berwick, said Fredette was included in planning and invited to Wednesday’s news conference. Fredette said he couldn’t be at the State House on Wednesday because of a scheduling conflict. “I didn’t even know there was a press conference,” said Fredette, who added that the first he heard of a final plan was through his chief of staff, who met with Eves’ chief of staff late Tuesday afternoon. In a Dec. 1 letter to Eves and Thibodeau, Fredette requested that House Republicans have a seat at the negotiating table. In a Dec. 8 letter from Thibodeau to LePage, Thibodeau said the plan would include “comparable funding” for both the 10 new agents and additional treatment, prevention and drug education programs. Thibodeau also pledged to have the package approved by the Legislature and ready for LePage’s signature by Jan. 14, 2016. “While the final details are still being worked on, I am confident the Legislature will take action quickly once session starts in January,” wrote Thibodeau. Fredette said he agrees that the issue requires quick action, but not without time for the Legislature’s Criminal Justice and Health and Human Services committees, as well as House Republicans, to weigh in. Fredette’s objections recall his role in state budget negotiations earlier this year, during which he and House Republicans were at odds with Democrats and Senate Republicans over the details of the budget. Fredette claimed at the time that he was being excluded from negotiations, though the other legislative leaders disputed that. Meanwhile, heroin continues to flow into Maine. Department of Public Safety spokesman Stephen McCausland said early Wednesday that the Maine State Police seized $25,000 worth of heroin during a traffic stop on I-95 in Kennebunk. In custody and charged with trafficking heroin are two men from the Bronx.